The EA places pending BuyStop and SellStop orders before news release at a specified distance from the current price. Time of news is set every morning in the EA's parameters. You also need to specify minutes before news to place pending orders and minutes for removal not triggered pending orders. The EA can place a series of pending orders. Number of orders in the series is specified in external parameters. 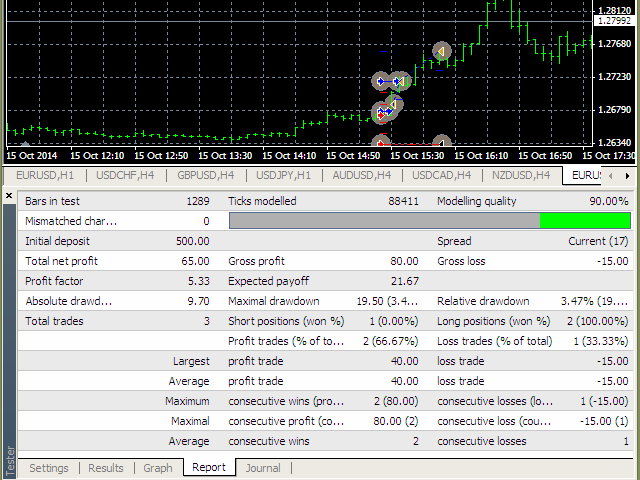 In this case a step for placing pending orders will be equal to the profit. The EA sees 2-3 and 4-5 digit quotes. Parameters' values are set in points (the second or the fourth decimal place). The EA works on any instrument and TF. You can set a special number to filter the EA's orders from orders of other tools. You can attach the EA to different charts with same instrument but different time. In this case you should set different numbers for each chart. You don't have to change a number if charts have different instruments. There won't be any confusion. 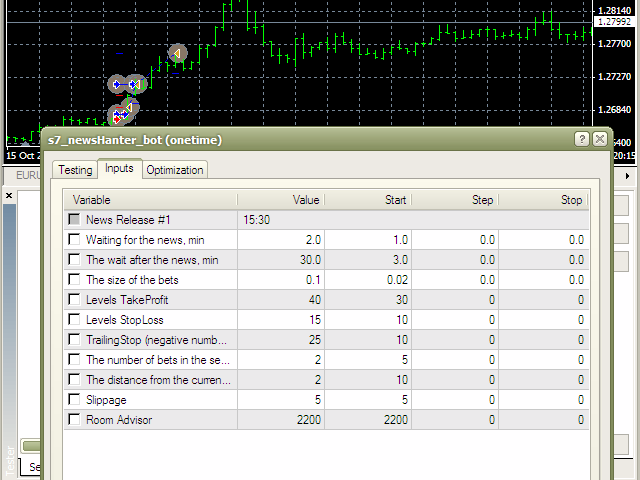 Figures indicate an example of the EA setting and its testing in the terminal's strategy tester. We took one trading day and one piece of news as an example. Parameters are set without selection and optimization.